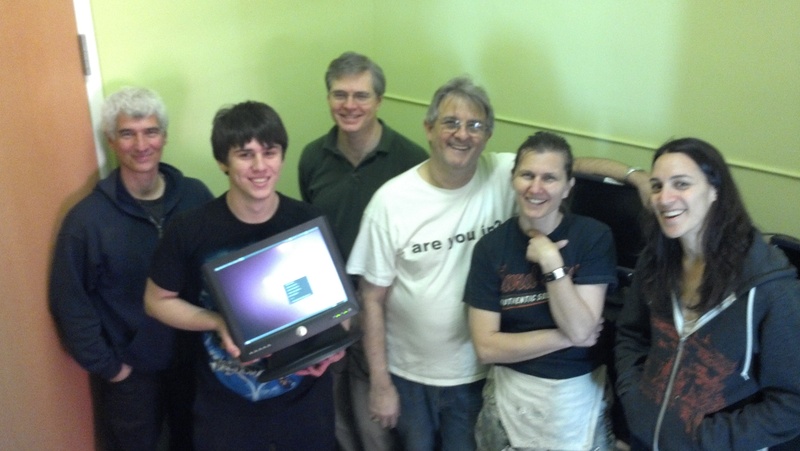 Here is a picture of the team that did the installation work today, Saturday, January 28, 2012, at the Creative Arts public charter school. Not pictured are Asheesh Laroia, who arrived after this picture was taken, and Christian Einfeldt, who took this picture with his Linux-powered Droid 3 phone from Motorola. I just was not able to fit this picture into the previous post, so I had to add a separate post. This was written by Christian Einfeldt. Posted on Sunday, January 29, 2012, at 4:54 am. Filed under News. Tagged Dina Moskowitz, Grant Bowman, Harley Strazzarino, John Strazzarino, Maria Jenerik, Tom Lopes. Bookmark the permalink. Follow comments here with the RSS feed. Post a comment or leave a trackback.